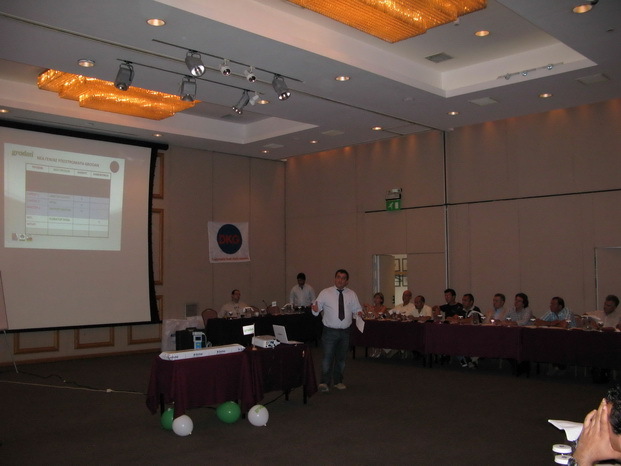 The 6-phase model, from planting to production concept, new products, as well as the upgraded service-technical support, that is already provided since 1992 free of charge, presented with festive character, in the Annual Assembly of the Grodan-DKG Club members, on Thursday 25 June 2009, in the overcrowded conference room at Fenix Hotel in Glyfada, Greece on the occasion of GRODAN’s completion of 40 years of expertise in the international market and 17 years in Greece. The event was attended by many growers from all over Greece ( Lemnos, Syros, Crete, Patras, Northern Greece, etc,) while the speakers were the President of DKG Group Mr. Evagelos Drimtzias, the Executive Director of DKG Group Mr. Christos D. Katsanos and the Director of ANTHESIS Co. Mr. Georgios Komianos. On the third topic of management of irrigation, Mr. Katsanos stressed it characteristically: “Hydroponics was discovered from ancient, in order to save time, where we would find ourselves in the greenhouse. It needs to invest and work in order to see someone results. Service is what plays the most major role for your support and for the proper use of substrates, that are used, and not only. If you give, it’s sure that you will pay back”. Later on, the Director of ANTHESIS company, Mr. Georgios Komianos presented the subject of “Greenhouse Integrated Pest Management ”. Mr Komianos gave the definition of integrated management, which is the optimal control of pests and diseases, while mentioned in the categories of such controls, including the biological, chemical and cultural control methods. He has not hesitated to refer available methods for management of greenhouse pests, e.g. chemical, but also advantages of integrated management, such as better production in terms of quality and quantity (pesticides residue free). Followed by discussion on the concerns of the growers, who put questions to the speakers and received answers and solutions to their concerns. The end of the event followed by a buffet dinner, where the discussions followed in a pleasant and festive atmosphere.